My husband is addicted to cereal. Ok, maybe addicted is too strong a word, but he would gladly have me stop cooking and just serve him cereal and milk for 3 meals a day. Where I live, cereal is quite expensive. As high as 5 dollars for a "cheap" normal sized box. Imported American brands can go for up to 7 dollars for a measly little box, so... I guess you can imagine that I try to wean my husband off of cereal. I've been looking for satisfying alternatives for breakfast, especially if those alternatives would satiate that "cereal craving" and have decided that oatmeal makes a good, cheap, hearty breakfast. I'll share in a future post how I make my oatmeal delicious and interesting. However, I am not always in the mood to cook food when I first wake up, and don't want to dirty another pot if it is not necessary. The cheap cereal solution? Raw oats with milk or yogurt. This is a perfect cereal alternative and even tastes and feels like cereal. They sell this prepackaged in the store and call it muesli. But why would I want to buy it premade at 3 times the price of making it myself? I embellish the cereal with any of the following: a sweetener like sugar, honey, or molasses; some cut up fruit (non citrus- like apples or bananas or plums); chocolate chips (remember what I said here about using up bulk foods too quickly? ); dried coconut; flax seeds and or whole sesame seeds; dried fruit if I buy them cheap (like raisins). Usually I use yogurt instead of milk with my meusli. This comes out delicious and is even friendly for those who wish to soak their grains. 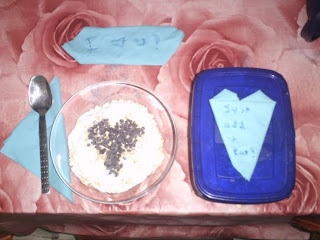 Here is my artfully arranged breakfast that was waiting for my husband when he woke up yesterday morning. No, it wasn't a present I bought, but it was a kind gesture to prepare him breakfast the night before. I think he appreciated it. We have a family dinner once a week in which I serve fresh bread. On days like today (that I don't have the head space to be making bread, kneading, shaping, etc... 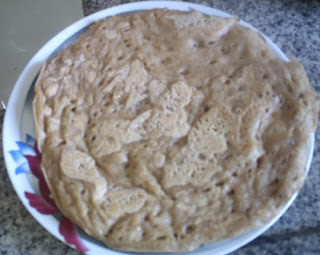 I find that Yemenite flatbread, Lahuh, a spongy pancakey yeasty flatbread, is a decent replacement for bread for our dinner. Lahuh (pronounced with a guttural kh) is quite easy to make and seems easier than regular bread making, though I've never timed the difference. Combine all the ingredients and mix well. 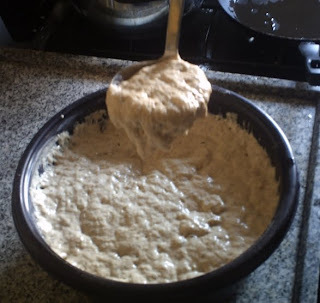 Let the mixture sit in a warm place for an hour to rise. Rub a non stick pan with oil. You do not want to be able to see the oil (if you can see a pool of oil, it means you put in too much, and it'll be harder to make the lahuh), just rub it in so you know it is there. I use a cloth napkin to rub in the oil. Take a ladle full or two (I prefer one and a half ladles) of dough. Turn the flame on under the pan to a medium high heat. 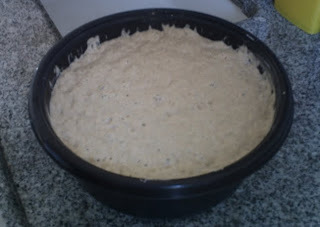 Lots of bubbles will begin to appear in the dough, and it will begin to have a cooked appearance. First to cook will be the outside and the inside is cooked last. Traditionally, you should be done at this point, but I find that if I wait to let the lahuh cook thoroughly on the inside, the bottom becomes crispier than I would like. 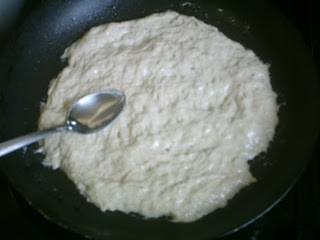 When the dough is mostly cooked aside for that last raw center, you want to flip it over with a spatula. Leave the lahuh to cook on the other side for 30 seconds to a minute. Then slide the cooked lahuh onto a plate. Before you repeat this process, you want to let the pan cool down, as if you try to make a new lahuh without letting the pan cool, it will toast the bottom of the lahuh too quickly. To make this cooling off process go quicker, I stop up my sink and put in an inch of cool water. I dip the bottom of my pan in the cool water (yes, I know, this shortens the life of a pan but I couldn't care less) for a few seconds, wipe dry, and then make the new lahuhs. I find that I need to re-grease my pan every 2-3 lahuhs. You know you need to re-grease when the lahuh starts sticking to the pan instead of sliding out easily. Yield: Between 7 and 10, depending on the size. Traditionally, these are served with fenugreek dip and grated tomatoes, but I'm going to be untraditional and serve them with lacto-fermented salsa and homemade whole grain tahini. 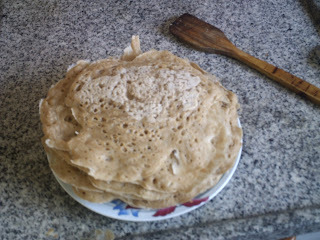 Variation: These can be made completely with white flour, simply by substituting. 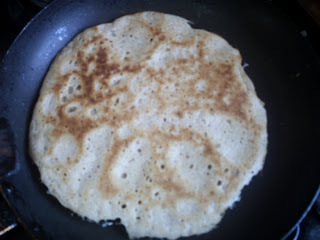 We used to buy these lahuhs from a vendor, but now that we know how easy it is to make them, we make this simply delicious flatbread quite often. 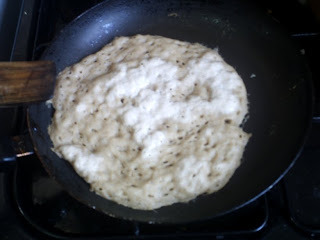 Do you ever make or eat flatbreads? What type do you like best? Ever make lahuh before? I failed at grocery shopping. Health and Cost- Which Supersedes?